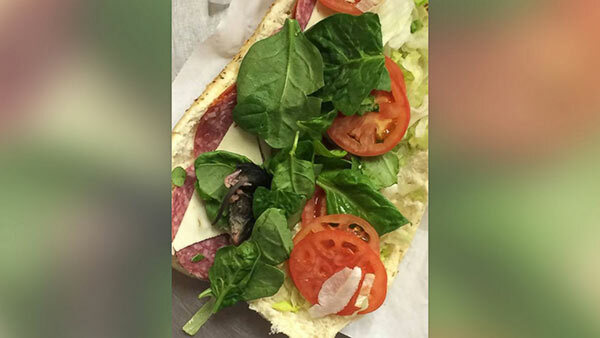 LINCOLN CITY, Ore. -- An Oregon man said his friend discovered a rodent inside a sandwich at a Subway restaurant, according to ABC News. Matt Jones says he was at a Subway restaurant in Lincoln City, Oregon with some coworkers on Oct. 6 when he heard a commotion at the counter. He says when his friend opened up his Italian sandwich, he found a dead rodent between the spinach and cheese. "Thankfully it was discovered before Jay took a bite of a dead mouse!" Jones said. Jones says he brought his own sandwich up to the manager because it also had spinach on it, and got a full refund. "As soon as the customer alerted the owner about what happened, they were immediately given a full refund and an investigation was launched," Subway said in a statement. "To be cautious, all of the products in the sandwich unit were disposed of and a thorough cleaning took place, in which the Health Department gave the restaurant a clean bill of health. There were no other complaints made and this was an isolated incident." The Lincoln County Health Department says it was immediately notified and health inspectors investigated. A health official said the rodent was found in the sandwich before the inspector arrived and was viewed by the inspector when he came to the business. According to Cheryl Connell, the director of Lincoln County Health and Human Services, the rodent did not come from inside the Subway. "The inspector determined the most likely way the rodent got into the restaurant was through the bagged product the restaurant issues for the sandwiches," Connell said. In terms of how the manager handled the situation, Connell says "the restaurant responded swiftly and quickly and accurately for what they needed to do to sanitize the area as required by the health inspector."